If you’re a ’90s kid like I am, chances are you’ve got a soft spot for Batman: The Animated Series. For my generation, and even for a number of younger fans, it’s the definitive take on Batman and his world. As such, artist Rick Celis and his many tributes to the series have hit me right in the nostalgic feels. Not only has Celis nailed down the look of the characters and the show, but he often uses it to pay tribute to more current works. To illustrate, I’ve included some of my favorites below. You’ll see his send-ups to the Jim Lee variant for Batman #50, and the main cover for Batman #42. He’s also prone to giving nostalgic goodies like this tip of the hat to Runaway Bride (in the spirit of the recent Batman/Catwoman wedding, of course). More of Celis’ work can be found on DeviantArt, Twitter, Instagram, and Patreon. This entry was posted in Astonishing Art, Comic Books/Graphic Novels and tagged Astonishing Art, Batman, Batman #42 (2018), Batman #50 (2018), Batman: The Animated Series, Catwoman, comic art, comic book art, Jim Lee, Jim Lee art, Julia Roberts, Lois Lane, Mikel Janin, nostalgia, Richard Gere, Rick Celis, Rob Siebert, Runaway Bride (1999 Film), superhero weddings, Superman on 07/25/2018 by primaryignition. Patrick Zircher posted this little gem on his Twitter account yesterday. Catwoman won the Trinity artist’s latest “Should I draw:” poll. Specifically, the version from Batman: The Animated Series. He made sure to get Selina’s cat Isis in there as well. I’ve always been a sucker for this costume, which was of course designed by Bruce Timm. Not just because of its association with the show, either. It’s sleek and simple. It doesn’t scream for attention, because your eyes are drawn to it anyway. It’s like Selina Kyle in that sense. 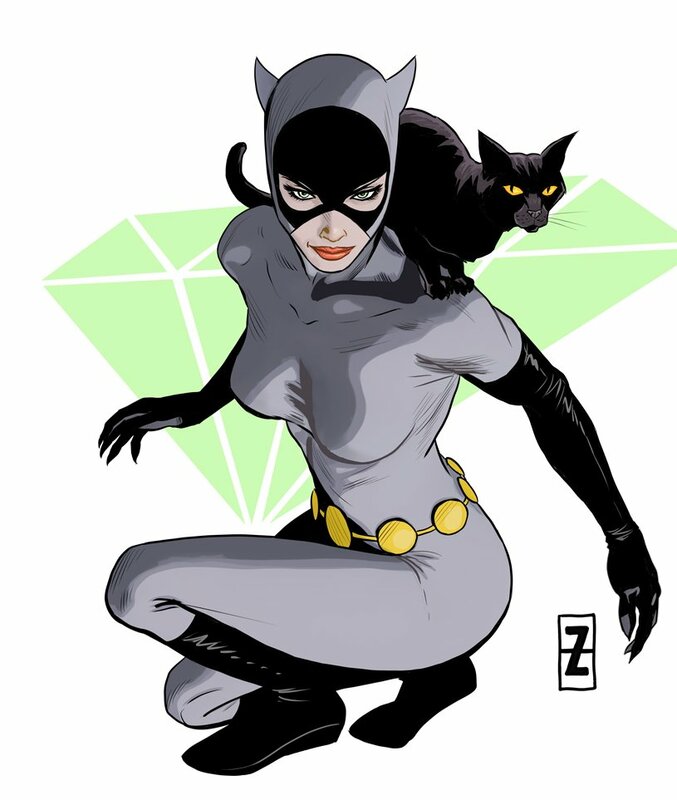 Catwoman has donned plenty of outfits in her near 80-year career. But you can make a pretty strong case for this being the best one of all. This entry was posted in Astonishing Art, Comic Books/Graphic Novels and tagged Astonishing Art, Batman: The Animated Series, Bruce Timm, Catwoman, Catwoman costume, comic books, comics, Patrick Zircher, Rob Siebert, Selina Kyle, Twitter on 04/15/2018 by primaryignition. There’s a school of thought that says the comics based on Batman: The Animated Series, created by the Paul Dini, Kelley Puckett, Rick Burchett, Ty Templeton, etc, were some of the best Batman stories to come out of the ’90s and early ’00s. Looking at something like Mad Love, it’s tough to dispute that. I’m certainly not comparing Batman/Teenage Mutant Ninja Turtles to Mad Love, but the charming simplicity of it reminds me of those older books. This sophomore issue sees the Batman and TMNT of two different generations meet, as they investigate strange dimensional portals. Little do they know that other cross-dimensional meetings have also occurred. 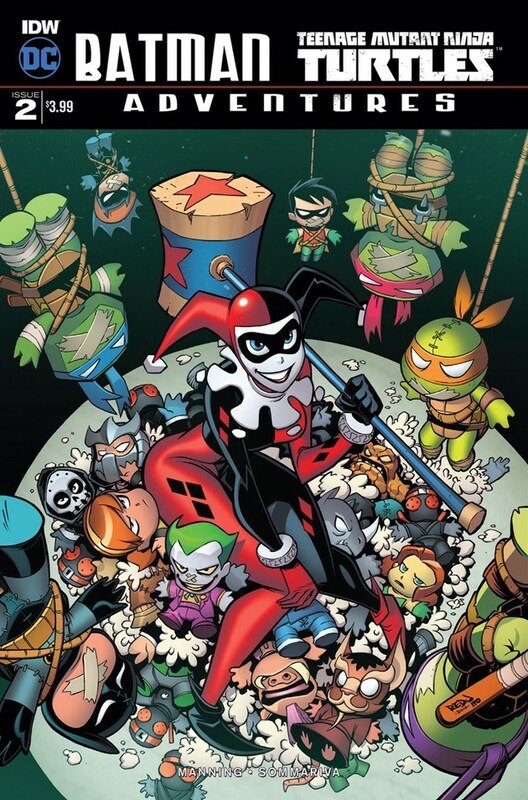 The Joker and Harley Quinn have lured Shredder and the Foot Clan into a trap. But as our heroes will soon learn, yet another Arkham escapee is in New York, and they’re looking for a fight. As one might expect, with two Teenage Mutant Ninja Turtles Adventures regulars on this title, it leans more in the TMNT direction in terms of look and tone. It’s still the Animated Series Batman. But the word “animated” has rarely been more emphasized. He, and the characters from his world, all essentially look like they’re appearing on the TMNT cartoon. As one might expect, the Joker and Harley feel this transition the least. And yes, we are allowed to see the reverse effect, if only on a variant cover by Rick Burchett (shown left). I was pleasantly surprised at how funny this issue was. Not laugh out loud funny. But I was tickled. There’s a bit where Joker is “struggling” to remember Shredder’s name, calling him things like Slicer, Grater, and the Juicer. Mikey later calls Robin a pirate, because of the “R” on his chest. It’s objectively stupid. But it’s fun. Perhaps I’m a little more receptive to the humor this time around, given how much more I’m enjoying it than the Tynion/Williams story (no offense, gents). That scene with Joker, Harley, and the Foot was a bit of a head-scratcher, as Mr. J simply outwits them. The TMNT buff in me wanted a more even exchange between them. But it’s early, of course. And from a story perspective, I imagine you have to find some way to justify Shredder wanting to team with this crazy clown. He’s obviously smarter than he seems. And as we find out in our cliffhanger, the team-up thing seems to be going around. Batman/Teenage Mutant Ninja Turtles Adventures has been a pleasant surprise. A fun ride for fans young and old. I’m most certainly coming back for a third slice! Follow Primary Ignition on Twitter @PrimaryIgnition, or at Facebook.com/PrimaryIgnition. 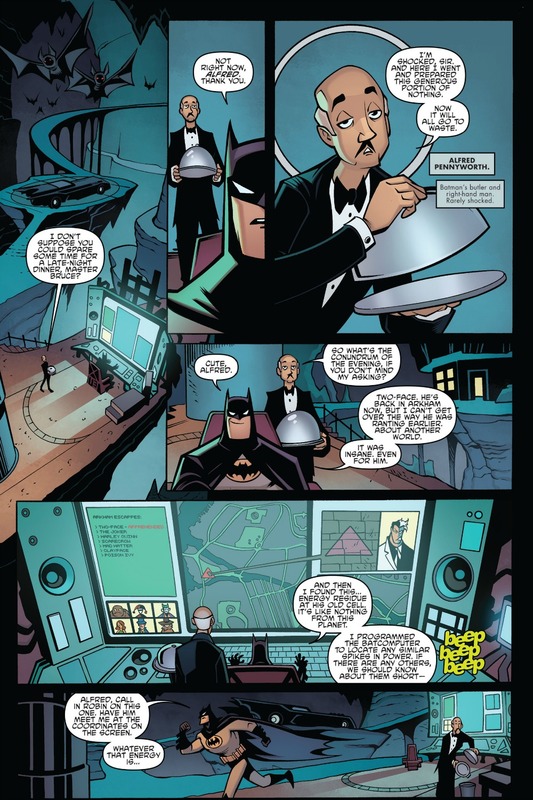 This entry was posted in Comic Books/Graphic Novels and tagged Batgirl, Batman, Batman/Teenage Mutant Ninja Turtles, Batman/Teenage Mutant Ninja Turtles Adventures, Batman/Teenage Mutant Ninja Turtles Adventures #2, Batman: The Animated Series, Bobby Curnow, DC Comics, Donatello (TMNT), Harley Quinn, IDW Publishing, Jon Sommariva, Leonardo (TMNT), Matthew K. Manning, Michelangelo (TMNT), Raphael (TMNT), Rick Burchett, Rob Siebert, Robin, Teenage Mutant Ninja Turtles, Teenage Mutant Ninja Turtles (2012 cartoon), The Shredder, TMNT on 12/16/2016 by primaryignition. PENCILLER: Jon Sommariva. Cover by Hilary Barta. I can understand why people liked the first Batman/Teenage Mutant Ninja Turtles series. It was the first time the Dark Knight and the boys in green met in any medium. While it had its flaws, for some of us, it was a big moment in fanboy culture. But this? This is more like it. While we have to repeat numerous story points, Batman/Teenage Mutant Ninja Turtles Adventures #1 is so much more fun than its predecessor. While the first story seemed to be aimed at older fans, this one is squarely directed at a younger audience. In this case, that makes for a more entertaining sandbox for these characters to play in. As is often the case with these crossover stories, there’s a dimensional portal involved. After a recent breakout at Arkham Asylum, members of Batman’s rogues gallery are finding their way into the TMNT world. 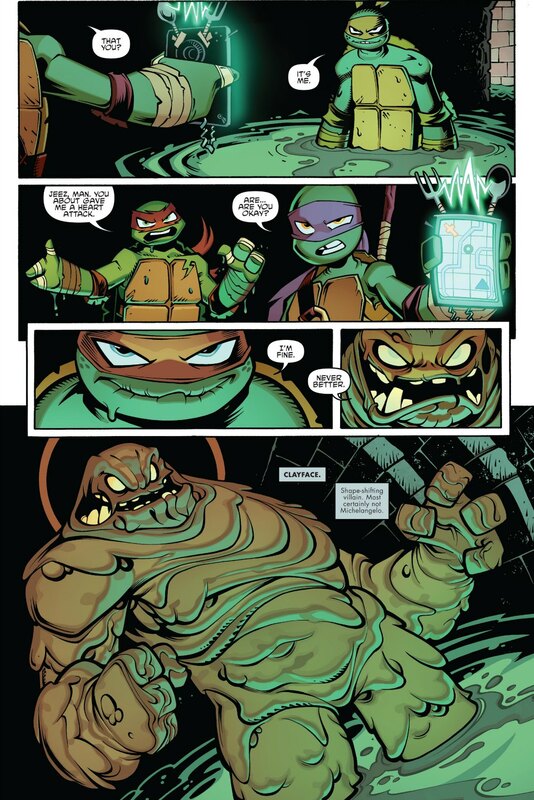 Case in point: The Turtles and April run into Clayface in the New York City sewers. And as we see by issue’s end, someone much worse is also there. But Batman isn’t fair behind, and the Turtles will gain a new and unexpected ally in the Dark Knight. Question: Do kids today watch Batman: The Animated Series? Those of us who grew up with it understand what a milestone it is. 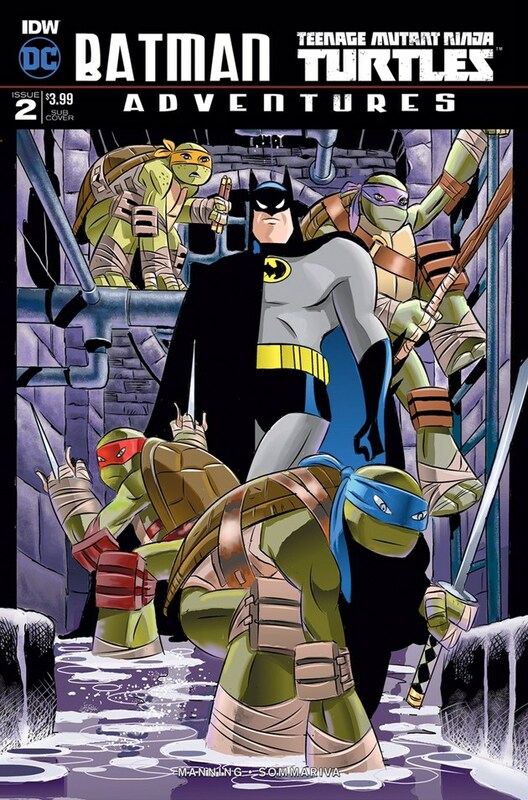 But for younger fans, is there any significance to seeing this version of Batman teamed up with this version of the Turtles? Or is it just a matter of this being a simpler version of the character that anyone can understand? Either way, it’s great to see these characters back on the page. They’re more cartoonish and exaggerated than they were on screen. But It matches the tone set by the Turtles. 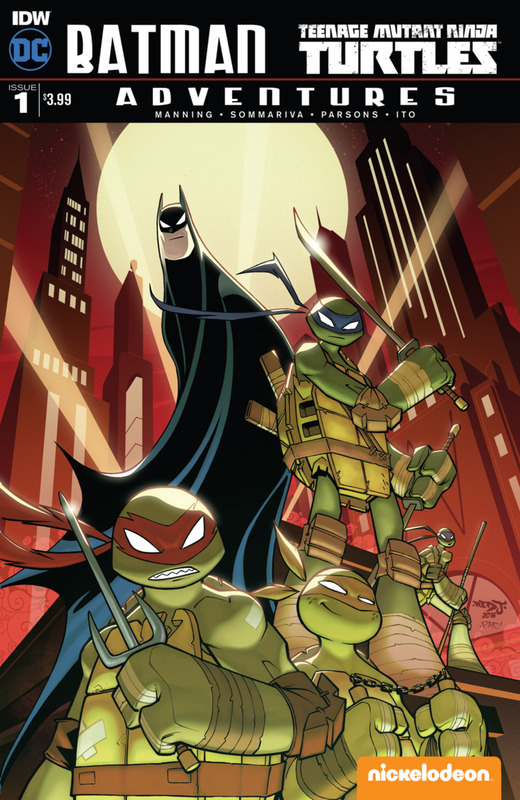 Matthew K. Manning is no stranger to either Batman or the Turtles, having worked on the comic book spinoffs for The Batman, Beware the Batman, Justice League, and the current TMNT cartoon. Oddly enough, he runs into a similar problem James Tynion IV did with the first issue of the other series. The Turtles come out sounding and feeling alright. But he has trouble capturing the Alfred so distinctly carved out by Efram Zimbalist Jr. He sounds too American, and is lays on too much sarcasm. Granted, he’s in the issue for all of one page. A minor offense to say the least. Clayface was the perfect villain to crossover against the Turtles. He has the dark and twisted edge of a Batman villain, but also the ugly monster element that a lot of TMNT villains have. You can easily picture him alongside some of the weird creatures of Dimension X. His scene with the Turtles is a lot of fun, particularly when he briefly masquerades as Michelangelo (shown below). The glory for that scene goes to penciller Jon Sommariva, inker Sean Parsons, and a colorist with the fitting name of Leonardo Ito. Look at the close-up of Mike on the page at right, with the one telltale drip coming off his face. We get that great subtlety, and in the next panel he goes full on monster. You also have that nice glowing green color. It’s very TMNT. This entry was posted in Comic Books/Graphic Novels and tagged Alfred Pennyworth, Batman, Batman/Teenage Mutant Ninja Turtles, Batman/Teenage Mutant Ninja Turtles Adventures, Batman/Teenage Mutant Ninja Turtles Adventures #1, Batman: The Animated Series, Clayface, comic book crossovers, comic book reviews, comic books, DC Comics, Donatello (TMNT), Hilary Barta, IDW Publishing, Jon Sommariva, Leonardo (TMNT), Matthew K. Manning, Michelangelo (TMNT), Ninja Turtles, Raphael (TMNT), Rob Siebert, single issue reviews, superheroes, Teenage Mutant Ninja Turtles, Teenage Mutant Ninja Turtles (2012 cartoon), Teenage Mutant Ninja Turtles (IDW), Two-Face on 11/11/2016 by primaryignition.